Hi Friends! Welcome back to the blog! Today I’m walking you through What I Eat In A Day! My meals will vary every day based on my hunger, what I’ve meal prepped and also what recipes we’ve made that week for our blog or YouTube channel. Because of our work (creating recipes) we go to the grocery store multiple times a week. One of my favorite stores to grocery shop at is Whole Foods Market 365. Below is a photo of me and my daughter Ella when she was just a few months old shopping at Whole Foods Market 365! If you’re wondering what the difference between Whole Foods Market and Whole Foods Market 365 is, it’s the shopping experience! The grocery store feels easier to navigate with a very bright, airy environment yet has the same high quality standards and amazing Organic product selection at an accessible price. TIPS FOR SHOPPING & SAVING! You may be thinking… isn’t Whole Foods Market expensive? Like any grocery store, it all depends on what you buy! The key to simplifying your grocery bill is to simplify your weekly meal plan and keep the majority of your meals plant-based. If you consume animal-based proteins, aim for these to be more of a compliment, rather than the focus of your meal. As a ‘retired’ personal grocery shopper for clients, I have shopped at dozens of grocery stores and I always come back to Whole Foods Market 365 for their amazing, quality produce selection, unmatched selection of Organic products and the 365 Everyday Value products which are a great price point for the quality you get. 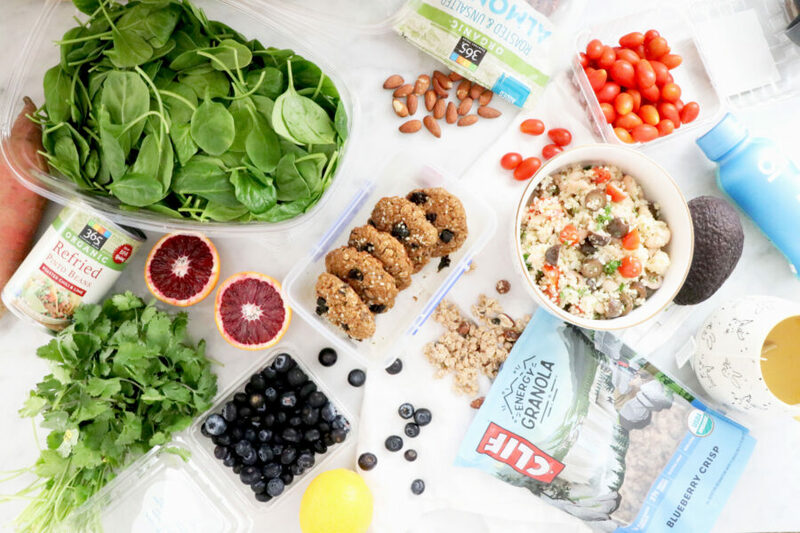 If you’re looking for ways to save at the grocery store, check out the Healthy Grocery Girl Membership where I provide shopping tips and meal plans that will help you spend less and enjoy more nourishing, plant-powered meals! Some days my meals and snacks are homemade and some days when my schedule is very full or I’m on the go, I’ll rely on more packaged convenience items. However, my goal is to always keep my choices plant-focused. It’s all a balance and the key for healthy eating is to do your best but don’t stress or try and eat perfect! There is no such thing as a perfect diet and nutrition is not one-size-fits-all. What you eat can and will vary day-to-day and season-to-season based on your personal needs! So with that, here is a one-day example of what I eat! I start everyday with a big glass of water, Organic coffee with almond milk and then either oatmeal, toast with avocado & egg or a smoothie. Today I made a smoothie bowl and topped with granola. 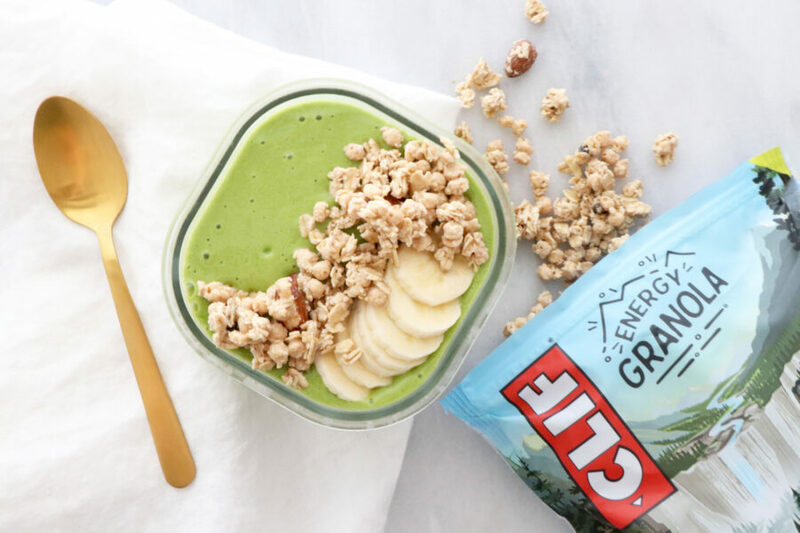 I picked up some Clif Energy Granola at Whole Foods 365 to try the first time and I am loving it! That is one of the many things I love about Whole Foods Market 365; the combination of 365 Everyday Value products as well as thousands of additional Organic, NON-GMO products from brands I love. I also take my supplements at breakfast, you can learn more about those here! Add all ingredients to a high speed blender and blend until smooth, this will be thick, so be sure to use a high quality blender with a tamper, such as a Vitamix. Pour into a bowl, top with slices of banana and as much granola as you like! I love roasted almonds and blueberries together! 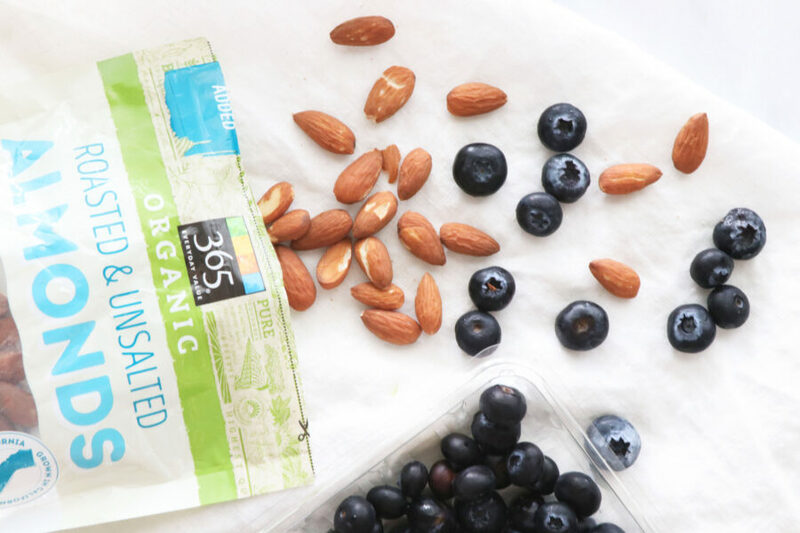 Almonds provide protein, fiber and healthy fats that keep me full and blueberries are packed antioxidants and add just enough sweetness to compliment the almonds. For lunch I’ve been making a quinoa Tabbouleh salad with white beans. I actually meal prepped this salad on a Sunday so I had quick and fresh lunches during the week! Cook quinoa according to package instructions, then let cool. Wash and chop the parsley and snacking tomatoes. 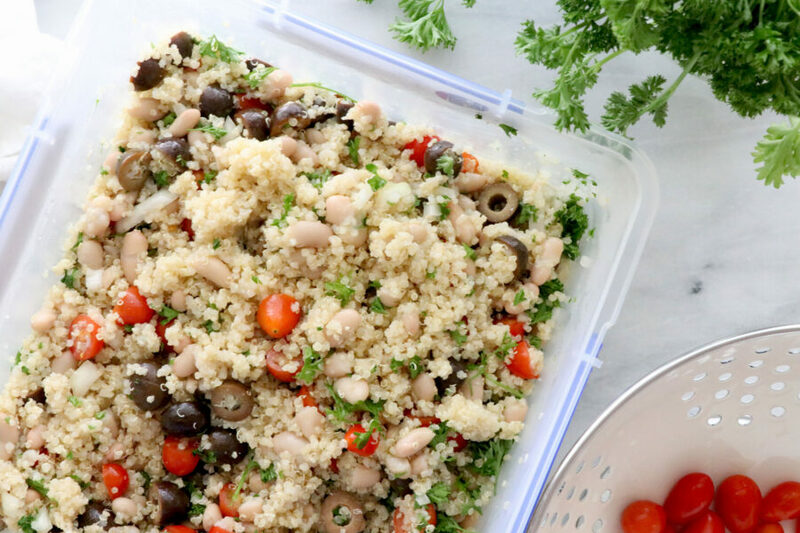 Add quinoa, parsley, tomatoes, white beans, sliced olives, olive oil and lemon juice to a bowl and mix together. I usually have hummus, carrots and crackers for an afternoon snack. 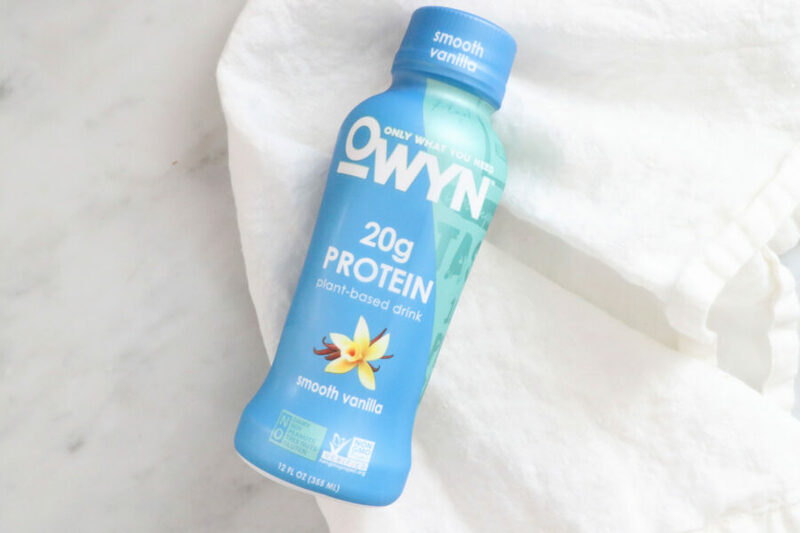 If I’m on the go I’ll have a Go Macro Protein Bar or I recently tried OWYN Plant-Based Protein Drinks, which are really good! For dinner we usually eat soup, tacos or pasta! 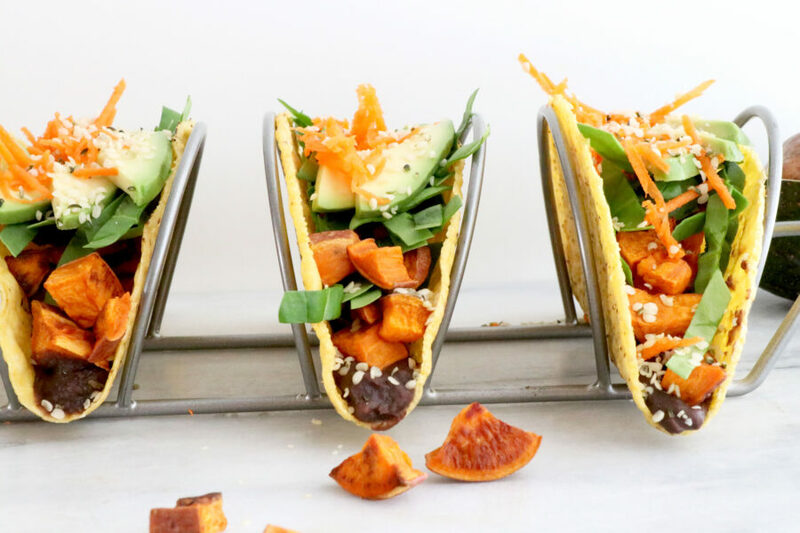 Tonight I made my favorite Sweet Potato Tacos! Preheat the oven to 400 degrees Fahrenheit. Scrub and rinse the sweet potato and cut away any bad spots. Chop the sweet potato into cubes about ½ inch square. Spread on a baking sheet and coat with coconut oil. Roast in the oven for about 30 minutes, stirring occasionally. Depending on your oven and the size you chop the sweet potato, roasting could take more or less time, just check on them often, they will be ready when they are soft and have started to brown. Meanwhile, warm the refried beans on the stovetop, and warm the taco shells if you like. 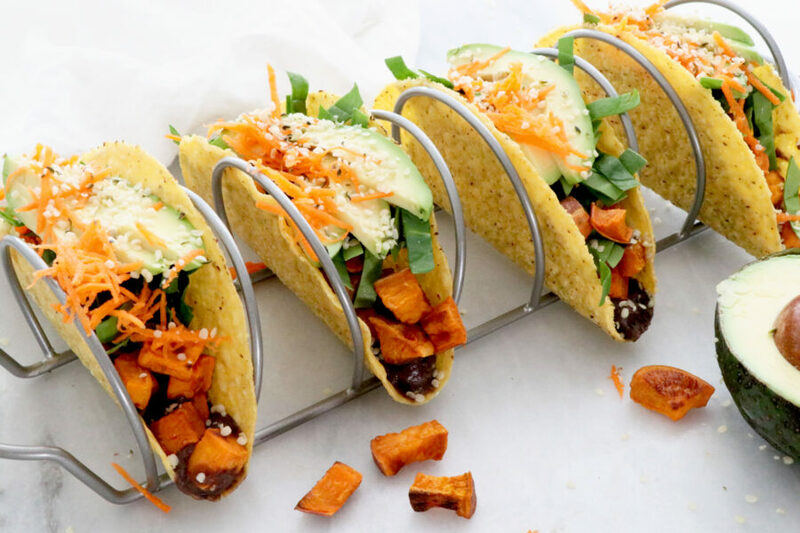 When the spuds are done, build your tacos starting with beans, then add the roasted sweet potatoes, greens, avocado, shredded carrots, salsa and hemp seeds. 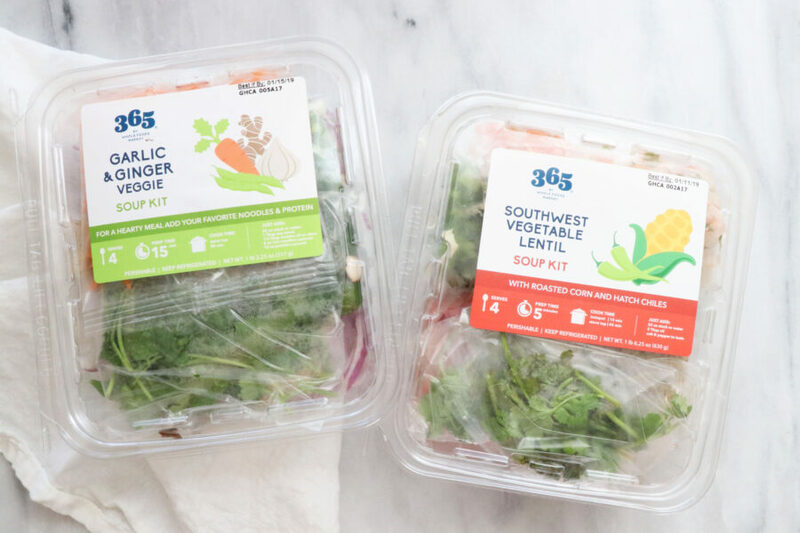 I have a ton of great soup recipes on the blog, but I also love the soup kits from Whole Foods Market 365! I recently made one of their soups in my Instant Pot and dinner was ready in less than 20 minutes… it was great! Every night after we put Ella to bed, I make a cup of chamomile ginger tea and sip on my tea while I watch TV with my husband and we unwind from the day. Sometimes I’ll have a homemade cookie like these Prune Protein cookies we made… recipe coming soon to the blog! And then as boring as this sounds I eat a bowl of oatmeal every night before bed too. It’s a habit I developed since Ella was born. The oatmeal has a calming effect and helps me feel relaxed and full to doze off to sleep! I’ve never been a great sleeper but every since Ella was born I’ve become more easy to wake, if you’re a mom I’m sure you can relate to the phantom cries that echo in your head when in fact she is perfectly happy and sleeping soundly. So now I always have my calming tea and oatmeal before bed and it helps me doze off to sleep peacefully. I’m also still nursing Ella and I find a small bowl of oatmeal before bed helps tide my hunger over until the morning. If I skip my oatmeal, I’ll wake up hungry in the middle of the night! I also drink a ton of hot tea, water and a sparkling water everyday! Also if you’re an Amazon Prime member like us, you receive special deals throughout the store, plus an extra 10% off hundreds of sale items at Whole Foods Market 365. Store signage will also indicate which products feature savings for Prime members. Blue sale signs indicate special deals only available to Prime members. Yellow signs on existing sale items indicate that Prime members get an extra 10% off those items (excluding alcohol). To take advantage of the savings, download the latest version of the Whole Foods Market app, sign in with your Amazon account, then scan the QR code in the app at the register! Everyday is different, but today’s post is one example of what I eat. I’d love to know some of your go-to favorite meals or snacks…. Share with me in the comments below! Disclosure: A big thanks to Whole Foods Market 365 for sponsoring this post! As a loooong time shopper at Whole Foods Market 365 it was so fun to partner together on this post!